A Saturn V rocket rolled out to the Launch Complex 39A at John F. Kennedy Space Center in Merritt Island, Florida. 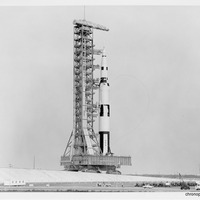 This particular rocket is suspected to be the full-scale mockup (SA-500F) used in 1966 to test vehicle assembly, fueling, and the crawler system of transporting it to the launchpad. The crawlers transported both the vehicle and the Launch Umbilical Tower (LUT) to the launchpad. In this photo, Launch Complex 41 is visible to the south. 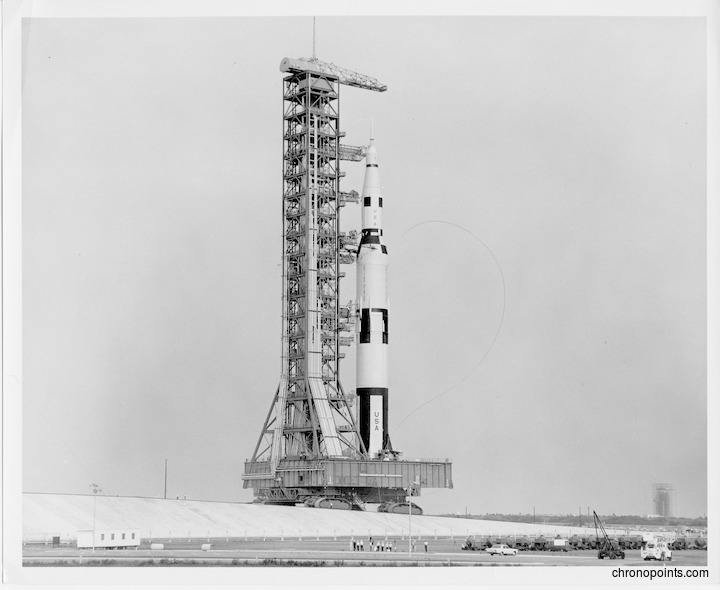 “Saturn V Rocket at John F. Kennedy Space Center Launch Complex 39A.” RICHES of Central Florida accessed April 25, 2019, https://richesmi.cah.ucf.edu/omeka/items/show/6377.